Certified. Nissan Certified Pre-Owned Details: * 167 Point Inspection * Warranty Deductible: $50 * Vehicle History * Includes Car Rental and Trip Interruption Reimbursement * Transferable Warranty (between private parties) * Roadside Assistance * Limited Warranty: 84 Month/100,000 Mile (whichever comes first) from original in-service date CARFAX One-Owner. Clean CARFAX. 15" Steel Wheels w/Full Wheel Covers, AM/FM/CD Radio, Brake assist, Electronic Stability Control, Front Bucket Seats, Panic alarm, Power door mirrors, Power steering, Power windows, Remote keyless entry, Speed control, Spoiler, Steering wheel mounted audio controls, Upgraded Cloth Seat Trim. Certified. Nissan Certified Pre-Owned Details: * Warranty Deductible: $50 * Vehicle History * Includes Car Rental and Trip Interruption Reimbursement * Limited Warranty: 84 Month/100,000 Mile (whichever comes first) from original in-service date * 167 Point Inspection * Roadside Assistance * Transferable Warranty (between private parties) Clean CARFAX. 15" Steel Wheels w/Full Wheel Covers, Air Conditioning, AM/FM/CD Radio, Brake assist, Electronic Stability Control, Front Bucket Seats, Power door mirrors, Power windows, Rear window defroster, Remote keyless entry, Speed control, Speed-sensing steering, Spoiler, Steering wheel mounted audio controls, Traction control, Upgraded Cloth Seat Trim. Certified. Nissan Certified Pre-Owned Details: * Vehicle History * Transferable Warranty (between private parties) * Includes Car Rental and Trip Interruption Reimbursement * Roadside Assistance * 167 Point Inspection * Limited Warranty: 84 Month/100,000 Mile (whichever comes first) from original in-service date * Warranty Deductible: $50 CARFAX One-Owner. Clean CARFAX. 15" Steel Wheels w/Full Wheel Covers, AM/FM/CD Radio, Front Bucket Seats, Illuminated entry, Power door mirrors, Rearview Monitor, Remote keyless entry, Speed-sensing steering, Spoiler, Steering wheel mounted audio controls, Traction control. Certified. Nissan Certified Pre-Owned Details: * Includes Car Rental and Trip Interruption Reimbursement * Vehicle History * Roadside Assistance * Limited Warranty: 84 Month/100,000 Mile (whichever comes first) from original in-service date * Warranty Deductible: $50 * 167 Point Inspection * Transferable Warranty (between private parties) CARFAX One-Owner. Clean CARFAX. 15" Steel Wheels w/Full Wheel Covers, AM/FM/CD Radio, Brake assist, Electronic Stability Control, Front Bucket Seats, Power door mirrors, Power windows, Remote keyless entry, Speed control, Spoiler, Steering wheel mounted audio controls, Upgraded Cloth Seat Trim. Certified. Nissan Certified Pre-Owned Details: * Transferable Warranty (between private parties) * 167 Point Inspection * Roadside Assistance * Warranty Deductible: $50 * Vehicle History * Limited Warranty: 84 Month/100,000 Mile (whichever comes first) from original in-service date * Includes Car Rental and Trip Interruption Reimbursement CARFAX One-Owner. Clean CARFAX. 15" Steel Wheels w/Full Wheel Covers, AM/FM/CD Radio, Brake assist, Front Bucket Seats, Illuminated entry, Rearview Monitor, Remote keyless entry, Split folding rear seat, Steering wheel mounted audio controls. Certified. Nissan Certified Pre-Owned Details: * Includes Car Rental and Trip Interruption Reimbursement * Warranty Deductible: $50 * Limited Warranty: 84 Month/100,000 Mile (whichever comes first) from original in-service date * Roadside Assistance * 167 Point Inspection * Vehicle History * Transferable Warranty (between private parties) CARFAX One-Owner. VA Inspected, CVT with Xtronic, AM/FM/CD Audio System, Bluetooth® Hands-Free Phone System, Brake assist, Front fog lights, Leather Wrapped Shift Knob, Leather Wrapped Steering Wheel, Nissan Intelligent Key, Rear Disc Brakes, Remote keyless entry, Smart Auto Headlights, Spoiler, SR Driver Package, Tire Pressure Monitoring System, Wheels: 17" Forked 5-Spoke Aluminum-Alloy. Certified. Nissan Certified Pre-Owned Details: * Vehicle History * Roadside Assistance * Includes Car Rental and Trip Interruption Reimbursement * Limited Warranty: 84 Month/100,000 Mile (whichever comes first) from original in-service date * 167 Point Inspection * Warranty Deductible: $50 * Transferable Warranty (between private parties) CARFAX One-Owner. Clean CARFAX. BACK UP CAMERA, BLUETOOTH/HANDS-FREE, PORTABLE AUDIO CONNECTION, 17" Aluminum Alloy Wheels, 6 Speakers, Air Conditioning, CD player, Electronic Stability Control, Power windows, Rear window defroster, Remote keyless entry, Speed control, Split folding rear seat, Steering wheel mounted audio controls, Traction control. Certified. Nissan Certified Pre-Owned Details: * 167 Point Inspection * Warranty Deductible: $50 * Roadside Assistance * Vehicle History * Transferable Warranty (between private parties) * Limited Warranty: 84 Month/100,000 Mile (whichever comes first) from original in-service date * Includes Car Rental and Trip Interruption Reimbursement CARFAX One-Owner. Clean CARFAX. BACK UP CAMERA, BLUETOOTH/HANDS-FREE, SATELLITE RADIO, PORTABLE AUDIO CONNECTION, Juke S, 1.6L I4 DOHC 16V, 17" Aluminum Alloy Wheels, Air Conditioning, Brake assist, Electronic Stability Control, Front Bucket Seats, Radio: AM/FM/CD/Aux-In Audio System, Rear window defroster, Remote keyless entry, Steering wheel mounted audio controls, Traction control. Certified. Nissan Certified Pre-Owned Details: * Limited Warranty: 84 Month/100,000 Mile (whichever comes first) from original in-service date * Transferable Warranty (between private parties) * Roadside Assistance * Vehicle History * 167 Point Inspection * Warranty Deductible: $50 * Includes Car Rental and Trip Interruption Reimbursement CARFAX One-Owner. Clean CARFAX. CVT with Xtronic, Alloy wheels, Automatic temperature control, Blind spot sensor: Blind Spot Warning (BSW) warning, Brake assist, Electronic Stability Control, Front Bucket Seats, Front dual zone A/C, Front fog lights, Fully automatic headlights, Power driver seat, Radio: AM/FM/CD/MP3 Audio System w/SiriusXM, Remote keyless entry, Split folding rear seat, Steering wheel mounted audio controls. Certified. Nissan Certified Pre-Owned Details: * Limited Warranty: 84 Month/100,000 Mile (whichever comes first) from original in-service date * 167 Point Inspection * Warranty Deductible: $50 * Roadside Assistance * Vehicle History * Includes Car Rental and Trip Interruption Reimbursement * Transferable Warranty (between private parties) Clean CARFAX. CVT with Xtronic, Alloy wheels, Automatic temperature control, Blind spot sensor: Blind Spot Warning (BSW) warning, Brake assist, Front Bucket Seats, Front dual zone A/C, Front fog lights, Fully automatic headlights, Radio: AM/FM/CD/MP3 Audio System w/SiriusXM, Speed control, Split folding rear seat. Certified. Nissan Certified Pre-Owned Details: * Transferable Warranty (between private parties) * Warranty Deductible: $50 * Limited Warranty: 84 Month/100,000 Mile (whichever comes first) from original in-service date * 167 Point Inspection * Roadside Assistance * Includes Car Rental and Trip Interruption Reimbursement * Vehicle History CARFAX One-Owner. Clean CARFAX. CVT with Xtronic, Alloy wheels, Automatic temperature control, Blind spot sensor: Blind Spot Warning (BSW) warning, Brake assist, Front Bucket Seats, Front dual zone A/C, Front fog lights, Fully automatic headlights, Power driver seat, Radio: AM/FM/CD/MP3 Audio System w/SiriusXM, Remote keyless entry. Certified. Nissan Certified Pre-Owned Details: * Vehicle History * Limited Warranty: 84 Month/100,000 Mile (whichever comes first) from original in-service date * Transferable Warranty (between private parties) * Warranty Deductible: $50 * 167 Point Inspection * Includes Car Rental and Trip Interruption Reimbursement * Roadside Assistance CARFAX One-Owner. Clean CARFAX. CVT with Xtronic, Alloy wheels, Automatic temperature control, Blind spot sensor: Blind Spot Warning (BSW) warning, Brake assist, Cloth Seat Trim, Front Bucket Seats, Front dual zone A/C, Front fog lights, Fully automatic headlights, Radio: AM/FM/CD/MP3 Audio System w/SiriusXM, Remote keyless entry, Split folding rear seat, Steering wheel mounted audio controls. New vehicle pricing includes all offers and incentives. Tax, Title and Tags not included in vehicle prices shown and must be paid by the purchaser. While great effort is made to ensure the accuracy of the information on this site, errors do occur so please verify information with a customer service rep. This is easily done by calling us at 540-496-7000 or by visiting us at the dealership. 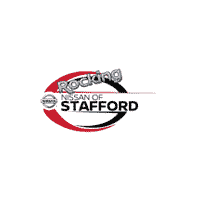 Rocking Nissan of Stafford	38.468779, -77.400069.